Carleton University is a partner in several sustainable transportation programs within the City of Ottawa. To facilitate your commute to and from the Carleton University campus, you can take advantage of the various programs that we have partnered with and developed to promote a cleaner and more sustainable environment. Please see below for more information on your commuting options. Walking is the most basic method of transportation. Millions of people around the world walk to get to and from work, school or wherever they need to go. The City of Ottawa and the National Capital Commission (NCC) have provided good infrastructure for those persons walking along city streets and the alongside the canal to get to Carleton University. Once on the campus, there is a well maintained designated “Safe Path” walkway to follow as you navigate your way across the campus. Anyone living within 30 minutes from campus should consider walking. It is good for the environment and it is good for you — get active! Carleton University is pleased to host the bike share program, VeloGo, on our campus. This program allows members and visitors of the Carleton community to borrow a bike from Carleton and travel around Ottawa in style. The bikes are available with everything you should need to explore the areas around our campus and further into the Capital; a basket for your backpack, groceries or school books, a lock to safely secure it while you run your errands or stop for lunch along the canal and three-speed shifting for Ottawa’s urban terrain. The bike hubs are located at the near to the front of Residence Commons and between the Ice House and Raven’s Nest. Bikes are accessible through the VeloGo app with costs at only $10/month (student rate) for up to 100 x 30 min rides. For more information on this exciting program visit: https://gohopr.com/velogo/ or email: sustainability@carleton.ca. 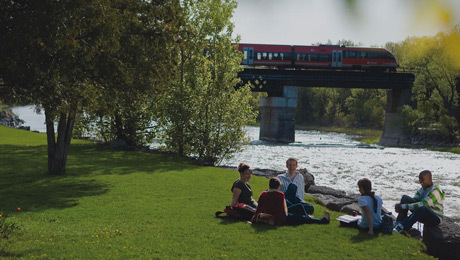 Getting to the Carleton University campus by bus or O-Train is a convenient option for many students, staff, and faculty. The transitway is a big part of the OC Transpo public transit system. It provides rapid transit service across the entire city on bus-only roadways and intersects with the O-Train. You can even combine cycling with your ride on public transit – the Rack & Roll program allows cyclists to bring their bicycles with them. Racks are installed on over 200 buses, including all articulated buses on several City of Ottawa transit routes. Bike racks are available on a first-come, first-served basis and some trips may not have a bike rack — if this is the case, you may need to wait for the next bus. There is no cost to use the rack, just your usual bus fare. Please refer to the OC Transpo website for fare information, route maps, and transit schedules to plan your trip to/from campus. Convenience and safe transportation is a priority at Carleton University. The university has developed designated taxi stand locations at Residence Commons and the Unicentre (Lot 2) to provide students, staff, and faculty with secure and easy access to licenced taxis. Designated pick-up points are also located at all major buildings on campus. The campus is well served by many reputable taxi service providers. Beware of bandit taxis — they are illegal. Put safety first and use only licenced taxis for your commuting/transit needs. Licenced taxis are easily recognized with an identification number, a City of Ottawa licence plate on the rear bumper, a tariff card on the window listing all the fees, and a photo ID card inside the car with an Ottawa logo. For more information on the Carleton University Safe Cab program, please consult the University Safety website at www.carleton.ca/safety. Carleton University provides flexibility in parking permit options for those persons wishing to organize/declare themselves as a carpool group. Parking permits may be shared among several vehicles so long as all vehicles are registered under the permit holder’s profile. Only one vehicle may be parked on campus at any given time and the same permit must be shared between vehicles. Contact Parking Services for further details. use your normal email address. Carleton University is providing the above information as an option and accepts no liability whatsoever for any issues arising from sharing rides. The transportation sector is the single largest source of greenhouse gas emissions in Canada and emissions from vehicles are growing faster than any other sector. Every litre of gasoline that a car burns produces 2.4 kilograms of CO2. In urban areas, vehicle exhaust can account for up to two-thirds of smog-producing pollutants. By carpooling, you can help lower the number of SOVs (single occupant vehicles) on our roadways, reduce CO2 levels, and help “green” our environment. Parking Services has partnered with VRTUCAR, and zipcar to make car-sharing available for members right here on campus. This venture allows Parking Services to offer yet another transportation alternative to our campus community. Car-sharing is a service that provides its members with access to a fleet of vehicles on an hourly basis. Many of these car-share companies are operated by car rental companies and are able to provide a variety of car-share vehicles for any user’s potential need. Members can reserve a vehicle on-line or by phone, choose the nearest vehicle station based on their specific need and then simply drive away in the registered vehicle. Conveniently, vehicles are located on campus: VRTUCAR/zipcar – Lot P4 (near the O’Train Station) and zipcar – Lot P2 (Unicentre)/Lot P17 (Residence Commons). And…if you can’t find a vehicle that suits your needs from the on-campus car-share inventory, there are pods of vehicles located nearby! According to a City of Ottawa report, owning and operating a motor vehicle can cost up to $10,000 annually. The average vehicle spends more than 95 per cent of the day parked and not used. When you car-share, you only pay for the time you use the vehicle. We have great appreciation for those members that commute to and from the Carleton University campus daily either by bus/train, by bike or on foot – Parking Services encourages this effort! We also recognize that by bringing car-sharing onto campus that we are offering yet another option on those days where you may require increased mobility, whether it is for leisure or business. Car-sharing helps reduce the amount of space used by vehicles. One car-share vehicle can replace up to 10 vehicles! Studies also show that car-share members also tend to use a vehicle only when they need it, opting for others modes of transportation such as walking or cycling instead of driving – reducing the GHG emissions produced by vehicles! HOW DOES THIS SERVICE WORK ON CAMPUS? Parking Services provides car-sharing companies with parking stalls (pods) for their car-share vehicles. Membership agreements are created/established between the users (you) and the individual car-share company. For more information regarding specific car-share membership/options/programs/pricing details, please visit their company website through the links posted above.